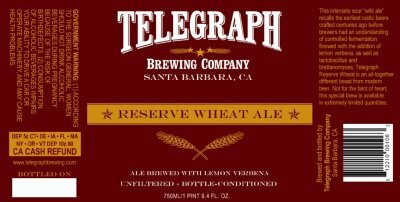 I took a random day trip to Santa Barbera to visit the Telegraph Brewing Co. 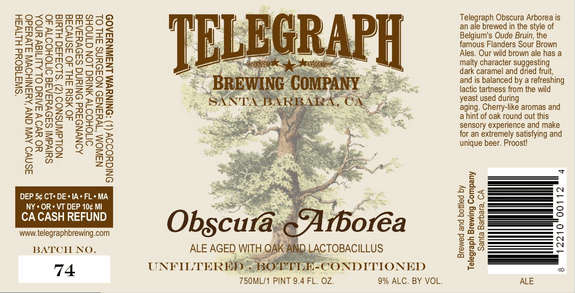 While there I picked up a bottle of their limited edition sour ale OBSCURA ARBOREA. After a few months of setting on it (unplanned, mind you) I decided to crack it open and give it a try. A few weeks back I decide to take a day trip up to Santa Barbara, California. 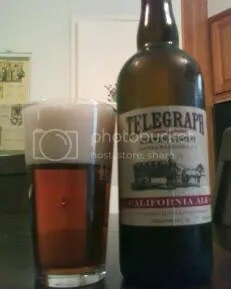 Along the way I remembered that Telegraph Brewing Company was located in beautiful Santa Barbara. Needless to say, I knew I had to make a trip to the brewery to check out what they had to offer straight from the tap. This was the first beer of the day. Reserve Wheat Ale is an American Wild Ale with a middle of the road 5.0% ABV.